This little fellow is ready for you party. Will you let him come? He is friendly! His big bushy tail and the flowers he sits among creates a pretty little setting for your special invitation and party decorations. The font styles - one flourishy and scripty, the other with a hand-printed look, creates a hand-made feel and an immediacy for your special event. Enjoy your party, here's hoping Little Fox will be there! 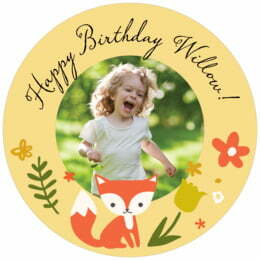 Customize your Forest Fox baby shower coasters today to add a distinctive element of fun to your event! 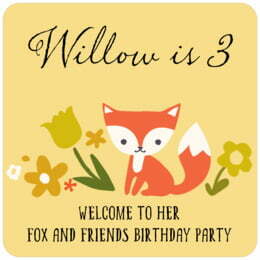 Forest Fox baby shower coasters come in multiple shapes—3.9" round, 3.9" square with rounded corners, and others. They are extra-thick, 58-point paper board. To give you an idea of how thick they are, a stack of a dozen coasters measures about 3/4" tall. They are made of absorbent pulpboard to help protect your surfaces. The coaster is also covered with a smooth matte coating to provide beautiful, crisp printing. Baby shower coasters are individually die-cut, so their top has a soft and rounded edge. They are designed to be disposable, but they are durable and re-usable. If unused, they can be kept for keepsakes and will keep forever. Evermine baby shower coasters are printed on one side only. On the blank back side, a small Evermine logo is tastefully debossed. Forest Fox baby shower coasters come beautifully packaged in boxed sets of a dozen.